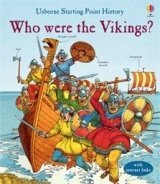 Nacházíte se: Booktook.cz → Jazyky → Angličtina → Dětská literatura → Who were the Vikings? Discover whether all Vikings wore horned helmets, why people were afraid of them and more in this fascinating illustrated guide to the fearsome Vikings, from their raiders and explorers to religion and family life. Internet links take readers to specially selected websites to find out more, plus there are contents and index pages for easy reference.